One of the joys of writing my book ‘Kevin Ayers, August 16th 2013, Deià’, is that a number of very interesting people have got in touch to tell me they’ve enjoyed reading it. Kevin’s voice and music have inspired many musicians over the years and continue to do so. 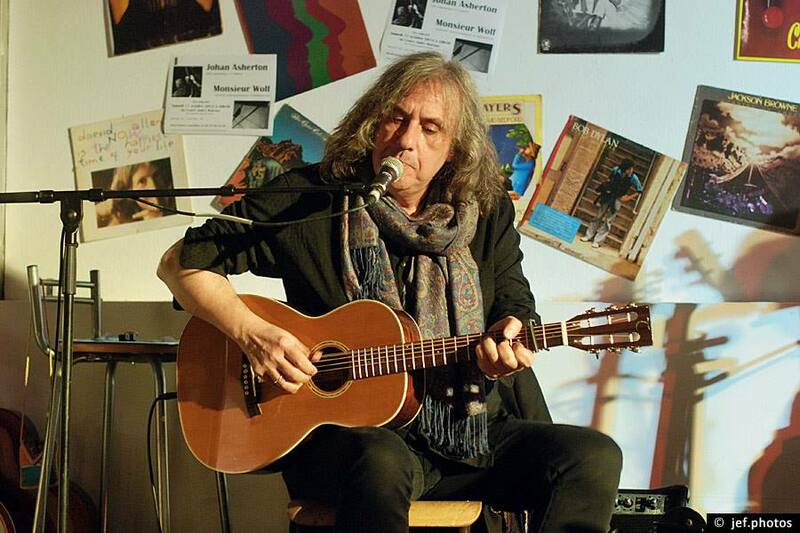 I recently talked to Johan Asherton, a singer-songwriter-guitarist from Paris who has been a dedicated Kevin Ayers fan for over forty years, about his enduring admiration for “Our Kev”. SJL: Johan, I’m delighted that you have taken such an interest in KevinAyers.org and my book. I once described you on this site as “Kevin Ayers in reverse” in the sense that you are French but always sing in English. Whereas Kevin was English but was well known for his ability to compose and sing in French, for example, ‘Jolie Madame’ and the French version of ‘May I?’ (‘Puis-Je?’). Why do you choose to write and sing songs in English rather than your native language, French? JA: I got into Kevin’s music in 1973, by the time ‘Bananamour’ was released, listening to ‘Interview’ on the radio. I was immediately taken by the voice, and the general atmosphere, ambience of the sound. I bought the album, and just loved it! ‘Shouting in a Bucket Blues’ was an immediate favourite, which I started to try to play and sing when I was 17 or so. At the time, I couldn’t imagine finding myself playing it on stage – or at a private acoustic evening, for that matter! JA: I was especially taken by his voice, vocal range – in fact I discovered…that I had the same sort of baritone, only slightly less deep or profound. SJL: Your “mature” voice is quite similar to his, I think. SJL: It almost seems as if Kevin was born with that incredibly deep voice. Or maybe he started smoking very young! On a different track…What aspects of Kevin’s music have influenced your own songs? JA: Many of his (earlier) songs are in the prog-rock style, which was never my cup of tea, but many others are in a straighter pop-rock area, definitely my own. Some of the artists who’d influenced (Kevin) had already influenced me, so to speak, like Syd Barrett or Lou Reed and The Velvet Underground. SJL: Wow! So which label was that? SJL: I have heard Pip Pyle mentioned before, in relation to Gong. What a cool album that would have been for us fans of the baritone singer and the guitar virtuoso! JA: Pip Pyle was a great drummer from the Canterbury Rock scene, and he and Kevin were featured on Lady June’s album, which Kevin produced. SJL: Yes, Kevin always chose his collaborators very well, from the Soft Machine days onwards such as Mike Oldfield, Bridget St John, Archie Leggett, Ollie Halsall, etc. Apart from the unique voice and incredible taste in musical collaborators, what else do you admire about Kevin? JA: I love his lyrics, and what I love above everything else in Kevin’s music is his sense of absolute elegance. He’s one of the truest dandies of rock, and there’s just a handful of them, I think. JA: I dream of a KA lyric book… Maybe one day? JA: Difficult for me to choose among so many great songs… I’d say ‘Yes I Do’ (from ‘Mananas’) for its delicacy, ‘Puis-Je’ for the charming accent and funny lyrics (the spoken section during the sax solo is something to be heard! ), ‘Jolie Madame’ with the lovely Bridget, ‘Another Saturday Night’, ‘Day By Day’ and ‘Stranger In Blue Suede Shoes’ , ‘Shouting In A Bucket Blues’ (of course)… so many…! SJL: Great choices, Johan. Mais oui… I catch his drift in ‘Puis-Je’, so to speak! You must regret that you never met Kevin in person or recorded with him. Surely the world would have been a better place for having an Ayers/Asherton duet? JA: I had his address and phone number in Montolieu for years… but never could gather the courage to call him… I hope I can visit Montolieu sometime in the future. His music has been with me for 40 years or so… And I often play ‘Shouting In A Bucket Blues’ during my solo concerts. JA: Johan Asherton’s Diamonds is a new band I’ve put together from long-standing musician friends. It’s a return to my rock’n’roll roots after a number of more folk music based acoustic albums. SJL: Loneliness sounds rather good fun there… nice touch of irony, Johan! I noticed there’s also a bit of wry Kevin-style humour in the track ‘Life Of The Party’, I think he would have appreciated that one! SJL: Did you have any sense with Kevin’s passing that you really wanted to get on and do and say the things that were most important to you? JA: Oh yes! ‘Life Of The Party’ in fact is really about this. So many of my musical heroes have passed away over the last two years… Lou Reed and Kevin in the same year. People can say what they want about the Rolling Stones, when you see them still rockin’ in their 70s… What a great lesson…! SJL: I know that you regularly play gigs in Paris, Rouen and Lille. Any plans to tour in England or further afield in France? JA: We just want to play from time to time, at least for now. I played England just a few times, solo acoustic, London 12 Bar Club, and several places in Wales. These days, I keep thinking I’m doing this for the sheer pleasure of making music with my friends, to people who will listen. SJL: Here’s a delightful “morceau” of recent live footage of Johan in Lille with Terry Brisack (guitar) and Pascal Favriou (keyboards). SJL: Thank you so much for talking to me Johan, it’s always interesting to hear a musician’s insights. JA: I’d like to take this opportunity to thank and congratulate both you and Rick for the beautiful Kevin site you created, and for keeping his memory and legacy alive. Johan’s 2012 “sombre folk” album ‘The House of Many Doors’ is also a personal favourite of mine and highly recommended.. I have been recently discovering your website because of a recent Kevin Ayers personal rething. I don’t know really. This Johan Asherton interview is interesting (he certainly is and I met him once in Rochefort at alas almost gone Rochefort en Accords). The questions all seem to complacent, though, honestly. The tone sounds patronizing, informed but a little hollow. Sorry, I don’t really mean to be, er, mean. I was originally seduced by your visit to Montolieu which I intend to visit one day myself, possibly, though it is not that important (for me). But I rapidly grew tired of the lazy references to romantic fields and your daughters falling asleep in the car, really. I think you should concentrate more on the quality of the music and of the lyrics and mostly the interaction between both and not on your longing to be close to the person rather than to the work of the artist. Similarly, your Didier Malherbe encounter was, to me, disappointing, not because of content (he certainly gave you a lot, he is ever so nice, always) although you could have tried to keep him a bit focused on the chronology as, in the end, it does not make much sense (except for those who were there at the time). Mostly, your constant awe at your luck and your thank yous kind of ruined the reading. Once again, no real mean feelings in what I am writing, none at all, just disappointment and also a few questions at the back of my mind. I also read, somewhere on Youtube, after that video of Feeling This Way in Rennes (Ubu, I was at that concert and Kevin and I had a chat backstage later and we played with some bananas and then decided to head to the bar where we had fun and drinks as expected, simply) that you “bought” that website??! A couple somewhere “bought” KevinAyersDotOrg? Good for you that the great Tim Blake and others contribute. I could prove rich in the end. At the moment, for such a website, one would expect a decent Kevin Ayers bio and a list of all (all) recordings and concerts, setlists possibly, even. Another (sorry) thing, is the constant reference to “our Kev”… He is not your Kev or our Kev. 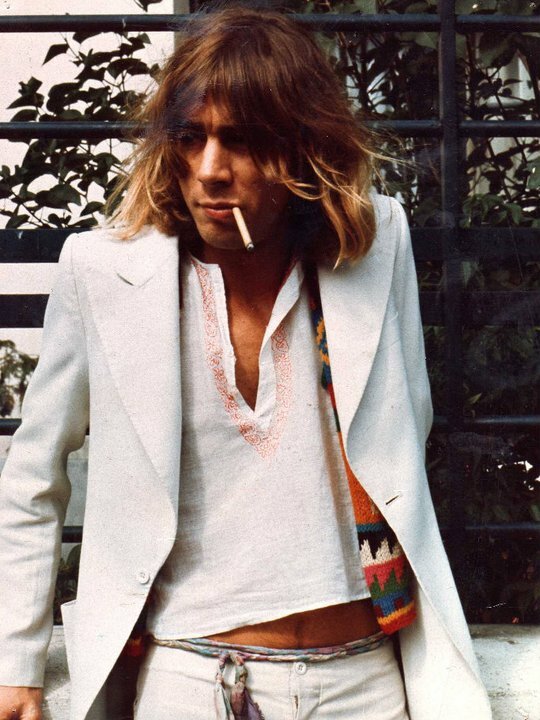 He was Kevin Ayers, a man in his own time, a stranger in blue suede shoes sometimes, mostly a man of his time and an original artist. In other words, he doesn’t and we don’t depend on you. But if you want to open up and not offer a self-centered and patronizing approach delivered in a mock modest puritan way, please do, we are all ears and eyes. Some good may come out of it. I am really sorry of the tone. I am. I just feel Kevin Ayers does not need all this. His work speaks for him. Coming back here (but not that durably, I am afraid) after last night, I find that the message I left was published on the website which I did not expect. Good surprise, not that I care that much, really, but at least that is a sign that you are not against life on what is more a blog than a site about Kevin Ayers. I will not repeat my criticisms. But re-reading that Johan Asherton interview, I suddenly noticed the presence of videos in there, nothing I am interested about. I might be interested in historical videos of course, and even videos if there is some real artistic act there, but chronically, I find the abstract presentation of music itself more accurate and close. But, among those video accompanying this John Asheton interview, there is one which is really totally incredible, there is a video (well sound clip really with no moving images) of the historical french band “Les Variations” , a band, as far as I am aware of, which has nothing to do with Johann Asherton. What is the point? My own bet is that you are desperate to feed things on this website and that you have (on lousy advice?) mixed Les Variations with The Froggies, a much later band, which indeed was Johan Asherton great and ill-famed band. If you have, then you cannot ever be taken seriously. I hope I am wrong and that you will provide some kind of satisfying explanation. PS: how about starting another “blog” on Mark E Smith, eh ? I “bought” (not sure why you need to use the quotation marks BTW) the domain name kevinayers.org because I wanted to make a site about somebody who has influenced my entire life. As much as I liked The Fall, Mark E Smith wasn’t influential for me and I was never interested in Kevin Coyne. Yes of course KevinAyers.org is a blog – I made it with Wordpress, which is a blogging platform. Wordpress is used by more than 29.4% of the top 10 million websites, so why not this one? However I don’t believe you are commenting about my choice of CMS, more the way the site is used. To enable interaction with readers, a blog is a perfect platform. I have no clue about your choice of CMS.. . I don’t even know what they are. The quotation marks about “buying” the website were a reference to the free-flowing exchanges of one fast-disappearing generation, precisely that of Kevin Ayers and all (after all Daevid Allen died not so long ago, fittingly on a full moon or about then if memory serves). As for Kevin Coyne, maybe you should give it a try one day, Kevin Ayers himself liked him and the reverse was true. Kevin Coyne did not like the bourgeoisie and certainly not (in his later life, at least) some of the people in Henry Cow, for that particular reason, but I don’t think he ever spoke against Kevin Ayers, but of course who knows..
I’ve read your comments with interest and appreciate your opinions. “Staggerlee” – a great Nick Cave song btw, not that I am in anyway a Cave expert, (I find myself secretly hoping you might be Mr Cave in disguise, which would be awesome!). The Johan Asherton interview came about because Johan bought my short book about the Kevin Ayers Celebration in Deià, then we met in Paris at one of his delightful concerts and struck up a correspondance. My major question for Johan was why he chose to sing in English, to which he said that English lyrics “rocked better” but there were some exceptions, hence the Les Variations video, which was his suggestion. Because Johan is a busy man, the interview was sliced together from a number of chats we had about all sorts of things. But he was emphatic about expressing his admiration for Kevin and the musicians that worked with him. As for the rest of the website. We have always said that it is “unofficial” and nobody pays us to do it. We also aim to be “inclusive” so it doesn’t matter if people are “newbies’ or life-long friends of Kevin; all are welcome. Often posts evolve when people get in touch with us. I will answer a few more of your points at a later date, I am currently preparing for an Art exhibition, another one of my enthusiasms! And by the way, about the visit to Montolieu, so charming and authentic, it goes without saying, now that Peter Mayle has finally kicked the bucket, are you, on the side, contemplating doing “A Year In Occitanie Alongside Our Kev” ? Just when we thought we were rid of this ? First, Staggerlee is not a Nick Cave song, it first appeared (in the USA, of course and in troubled times) some fifty years before said Mr Cave was born. There are thousands of versions. You will find out one day. It is not too late for that, it is never too late for Mississippi John Hurt, Bob Dylan and others. If Johan Asherton himself mentioned Les Variations and that was the reason you included that sound clip inside his interview, then you should have said so. As such it does not make any sense. Not any sense. Hoping my kind of irritation will make you feel that something is happening here, do you, Mr Jones. The “reverse” approach is just too easy and even “facile”, it does not focus on the artists’work. It is ultimately superficial (to me). Why not start a website or blog of your own and show us all how it’s done? Enough said. I’m going to bed!!! Do not worry, I am out of here, for good, as I want to feel the wind on my skin again. 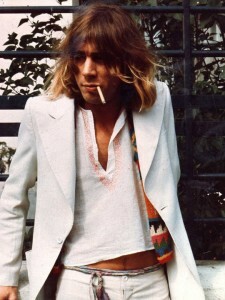 The last thing I will say (or repeat, rather) is that Kevin Ayers, here and there and now gone, was an artist. The only thing to speak for him is his work and I, likle many many others, like his work, respect him as an artist. Again, he is not, and never will be, “our Kev”, “your Kev” or even “Kev”. Please show some respect to the man. Bananas and all those sorts of things. Next post: Do You Know The Way To St Tropez? Previous post: How Kevin changed my life!